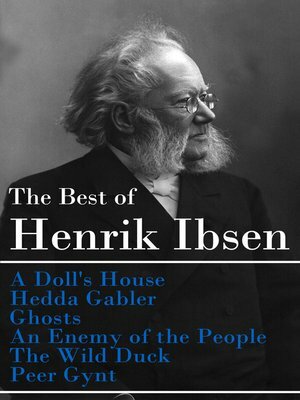 This carefully crafted ebook: "The Best of Henrik Ibsen: A Doll's House + Hedda Gabler + Ghosts + An Enemy of the People + The Wild Duck + Peer Gynt (Illustrated)" contains 6 books in one volume and is formatted for your eReader with a functional and detailed table of contents.1. A Doll's House is a three-act play in prose by Henrik Ibsen. It premiered at the Royal Theatre in Copenhagen, Denmark in 1879. The play is significant for its critical attitude toward 19th century marriage norms. It aroused great controversy at the time, as it concludes with the protagonist, Nora, leaving her husband and children because she wants to discover herself.2. Hedda Gabler is a play published in 1890. It premiered in 1891 in Germany and gained recognition as a classic of realism, nineteenth century theatre, and world drama. Hedda may be portrayed as an idealistic heroine fighting society, a victim of circumstance, a prototypical feminist, or a manipulative villain.3. Ghosts is a play written in 1881 and first staged in 1882. Like many of Ibsen's better-known plays, Ghosts is a scathing commentary on 19th-century morality. Ghosts had challenged the hypocrisy of Victorian morality and was deemed indecent for its veiled references to syphilis.4. An Enemy of the people is an 1882 play originally written in Danish in response to the public outcry against his play Ghosts, which at that time was considered scandalous.5. The Wild Duck (1884), in a sense, solved Ibsen's own moral dilemma as he struggled between a militant idealism (as in Enemy of the People) and his own worldly temperament. With a pragmatic, anti-romantic viewpoint, this drama presents a continuum between the opposing values of the Ideal and the Real.6. Peer Gynt is a five-act play in verse, based on the fairy tale Per Gynt. Written in the Dano-Norwegian language, it was first published in 1867. In Peer Gynt, Ibsen satirized the weaknesses of the Norwegian people, incorporating them into the character of Peer.Henrik Johan Ibsen (1828 – 1906) was a major 19th-century Norwegian playwright, theatre director, and poet. He is often referred to as "the father of realism" and is one of the founders of Modernism in theatre. His major works include Brand, Peer Gynt, An Enemy of the People, Emperor and Galilean, A Doll's House, Hedda Gabler, Ghosts, The Wild Duck, Rosmersholm, and The Master Builder.